Love the tank and seat! I'm normally in the "for the love of god enough with the mojave tanks" crowd.....but that combo on this bike is just too well suited for any naysaying. The Benelli tank is a cliche these days, but it looks so damn good! As much as I cherish the envy of hipsters, I am going to paint it. I like a well done patina bike, car or especially pick-up truck. But that is really not my style. I like clean and shinny. here is my last bike I built - the build thread is linked in my signature. My plan is to paint it a vintage looking light blue. 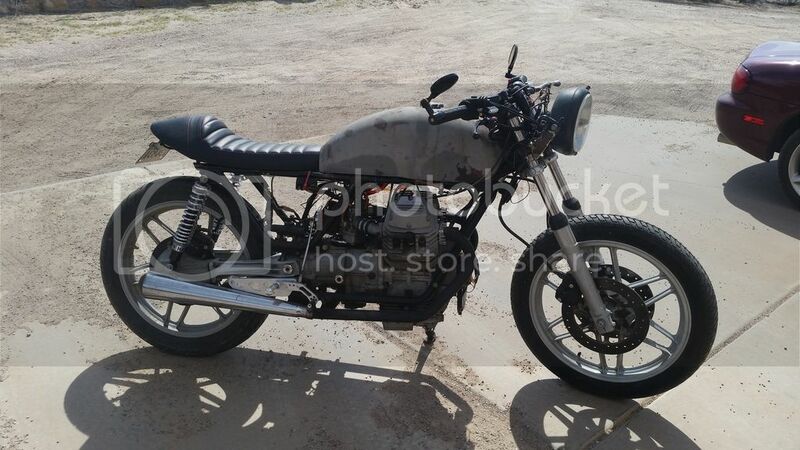 I think that will look pretty good with the brown seat and grips. I hope to polish a lot of the bike and clean up and paint the frame a very shinny black. Nice paint scheme it will be a beauty with this blue color. Personally, I would perfer knee indents darker than the tank but that's a matter of taste of course. VW Nimbus Gray with flat black indents could be another alternative? What's with the bracket obscuring the speedometer? Please keep the tank and don´t repaint it! It looks awesome with that orange used paint! already blasted off some paint to weld up some mounts.